The second annual Nuclear South West conference was held last month, when the Nuclear South West consortium and the South West Nuclear Hub joined together to offer the conference, which is a great chance to hear the latest news, network with potential partners and find out more about business openings. This year’s event had more of an international strand, with speakers from 16 organisations talking about how to connect to innovation and grow business in the industry, locally and globally. The conference set the south west nuclear industry in a national and global context, followed by updates from Hinkley Point C and other projects around the region. Delegates heard from businesses operating in the nuclear supply chain about how they are experiencing success in the industry. With the construction of Hinkley Point C now underway and with projects worth £50 billion to the regional economy over the next two decades starting to take shape, there are many opportunities for businesses. Matt Burley, Chair of Nuclear South West, opened the conference; the keynote speaker was Paul Howarth, CEO of National Nuclear Laboratory, said that innovation was the key success factor for the UK to achieve high profile in the industry internationally, and that the it needs to be “a country that does nuclear” rather than “a country where nuclear is done”. Greg Kaser of the World Nuclear Association have an overview of the current opportunities and threats in the global nuclear industry; Paul McCaffrey from the Department of International Trade presented on the Government’s role in supporting exporters and attracting investors; and Richard Bowman talked about Cavendish Nuclear’s new build mobilisation at Hinkley Point C.
Tom Scott from the South West Nuclear Hub, which is the UK’s single point of contact for nuclear research, said that nuclear has a crucial role to play in providing the country’s future energy, in particular by improving the capacity of the national grid, not least to accommodate the increased use of electric cars. The South West Nuclear Hub is the regional centre for HE nuclear skills, and is connected to the National College for Nuclear. David Eccles, Head of Stakeholder Engagement at Hinkley Point C, EDF Energy gave a fascinating overview of the “where we are now” at Hinkley Point C, with remarkable facts such as the number of tonnes of Welsh slag waste currently being used in the project. David was keen to point out that the real legacy of the Hinkley project is about creating a workforce that is highly skilled, generating a pool of employees that are equipped to take on the future roles generated by the wider nuclear industry across the region. Between presentations, a question and answers panel was held to explore supply chain opportunities. Melanie Sachar talked through how EDF is building the project on budget, on time, with the right standards of quality and safety. A key to the success of this is making sure that everyone is aware of their roles and responsibilities. Elena Alcantara provided the conference with an interesting insight into the Magnox Waste programme which provides secure options for dealing with waste, and Isobel Houghton gave a presentation on how Atkins attracts a broad pool of applicants to ensure they get the best people by using language and techniques that don’t deter minority groups and women. Anthony Prod’homme of Efinor Limited shared thoughtful insights into developing effective international partnerships through Anglo-French collaboration; saying that it takes time to build relationships and that company cultural differences can often be more of a barrier than national ones. Justine Salkeld gave an introduction to the role of the global company Ultra Electronics in the Energy market and Antony Croxford from Inductosense showed how his innovative ultrasound equipment can detect faults in structures through non-destructive testing. The conference was rounded off by an enlightening speech from Captain Andy Jackson, head of programmes for in-service submarines, who said that the country is experiencing unparalleled activity in the maritime sector. 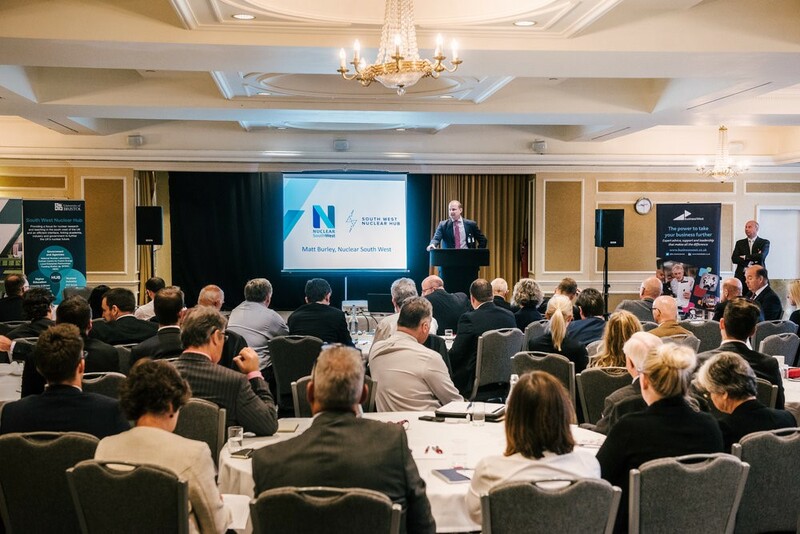 Matt Burley added: “This was our second successful conference and an important milestone on our journey towards realising the £50bn worth of business opportunities in the nuclear sector for the wider South West region. The speakers this year were diverse and informative, giving a real insight into the global overview of the industry and detail on technical specialisms in this sector.